Double acting Ball Angular contact bearings are designed to accommodate both radial and thrust loads with their large thrust carrying capacity being the primary design feature. These bearings are inch series and typically have angle of contact around 50 degrees. The ABD series design consists of a top and bottom angular contact plate with dowel pin holes for mounting, top and bottom brass cages and balls, and an intermediate plate. 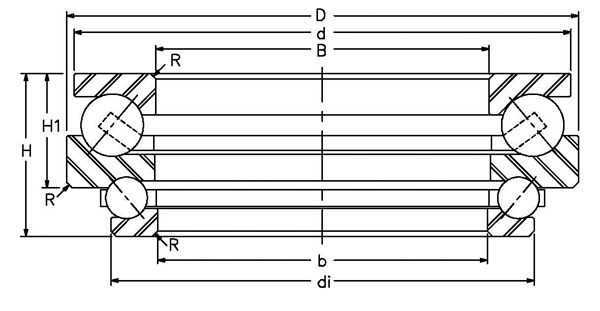 The two ball paths of the ABD series can handle thrust loads in both directions with the thrust capacity in one direction being much more than the other. Largely used at the bottom of vertical shaft applications, this design can accommodate large thrust loads while providing centering alignment for the shaft. Specific applications are machine tool indexing tables and oilfield rotary tables.